Need help identifying algae in your aquarium? See the quick descriptions below. And remember, no matter what type of algae is in your tank, your most effective long-term solution is effective nitrate control! Removing the primary food source of algae leads to effective algae control and prevention! Hair algae (aka, filamentous or thread algae) is generally light green in color but also appears in dark green to green brown colors. It grows in strings (filaments) and can attach to almost every surface. While its growth rate varies, it is mostly very rapid. This species is a hitchhiker and mostly imported by plants, snails, fish, driftwood, etc. The most common variations are Cladophora (rougher to the touch) Spyrogyra (slimy to the touch), and Pithophora (wool like, coarse). Diatoms are single celled algae, brownish in color. It starts out as a dusting on the substrate that rapidly turns into a mat that can cover the tank over in just 5 days. The diatoms are limited inmovement, relying on water current, and generally start at one point expanding rapidly. This species is found in freshwater, but predominantly in marine setups. It is not uncommon to experience diatoms with new setups, just about when the cycle is completed. Brown slime is an important algae especially for reef set-ups. It’s a symbiotic algae, which provides nutrients for invertebrates. Corals, clams, anemones and sponges harbor these algae for the same purpose – exchange of nutrients – while the brown slime algae enjoy protection from predators. Dinoflagellates has two flagella with which it can propel through the water. If uncontrolled, dinoflagellates build a brown slimy film covering most of the surface, in both salt and freshwater. Cyano = blue, also called blue green algae, but most species found in the aquarium are pinkish-red. Another common name for this algae is red-slime, because the algae cells form a carpet like mat with a slimy appearance. The mats come off easily by using a vacuum. Cyanobacteria are a single celled algae and actually more a bacteria. This algae usually starts out on one spot (dark with low water flow) then vastly spreading throughout the tank. As all single celled algae can grow fast, this one is the fastest. In an optimal environment, this algae can double every 20 minutes. Green water is often referred to as “pea soup”. Free floating single celled algae (Euglena), grows at such a rapid rate that it turns the water green. Water changes are not very helpful, as the algae spores can be found in almost every water source. As with most algae, this single celled planctonic algae is capable of photosynthesis (light is used to create energy). During lighting periods oxygen is being produced during this process. At night, the algae uses up oxygen from the tank, this can, if serious enough, suffocate the fish. Tanks with green water should therefore be very well oxygenated. Audouinella, black or dark purple in color, is mostly found on aquarium plants. Starting on the leaves it will eventually end up in little puffs all over the aquarium. Most vulnerable are planted aquariums with soft water and plenty of CO2. Specific algae types have certain requirements in order to settle within an aquatic system. These requirements include light, nitrogen, phosphate, silicates, dissolved organics, bicarbonates, iron, CO2 as well as numerous trace elements and minerals. 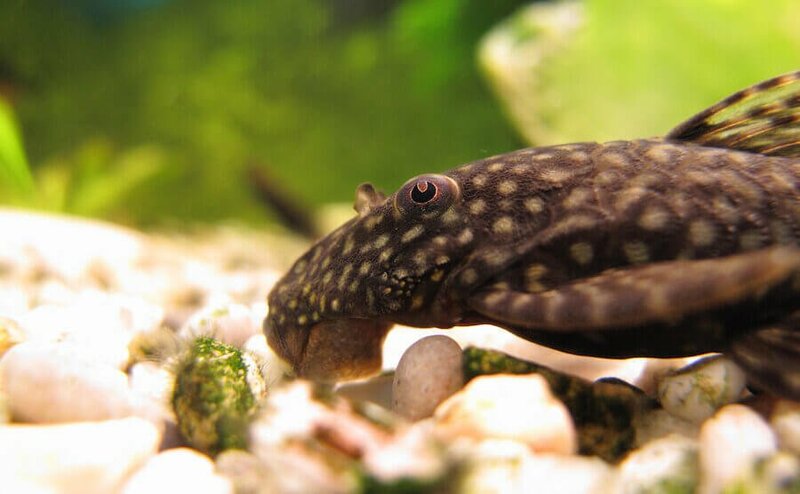 Introduction sources are either from live rock, sand, fish, plants, water source, foods, aquarium additives and other ways by means of adding anything to the aquatic environment. Algae spores are present in the water, and it is unavoidable for them to take hold. They will grow as programmed by nature. Imagine closing of a part of your back yard. Grass will grow higher, weeds will grow, eventually followed by brush and bushes then trees. This is all part of a natural succession, one making way for the other. In new aquarium setups a brownish dust can be observed just about when the cycle nears completion. The starting point making way for the others to follow. It also needs to be noted that some algae types can avoid other species to grow. Pithophora (Green Hair Algae) for example produces allelochemicals that suppress the growth of planctonic Euglena (Green Water). Cyanobacteria is also known to compete against green algae, which by the means of succession means that cyano follows green algae. Having close to perfect water conditions does not mean the algae will not grow, it will just be controlled by the means of the algae not taking over the entire system. Keeping in mind that the aquarium does not only consist of the tank itself. Filters, hoses, airstones, filter intakes, filter outlets, ornaments, corners, niches; all can collect debris, which in turn can then become a breeding ground and source of algae spores being released into the main “visible” tank itself. we have Hair Algae throughout the aquarium and as your note above says yes it has very rapid growth. Our tank is 135 gallons and I have added 2 of your algone packets to our filter and am replacing them each week. In addition I have added a UV sterilizer and still have the algae. I have also added a water fan at the bottom of the aquarium to create a current along the bottom. what can I do to make this algae subside? Limiting the nutrient sources such as nitrates and phosphates is always a long lasting solution. For now, good husbandry goes a long way. Change water regularly and reduce the lighting period by 50% In addition, check on your CO2 levels. You can roughly calculate them using this table. Increase the CO2 to elevated levels.